Coat chops with coating mix as directed on package. Place on baking sheet sprayed with cooking spray. Bake 20 minutes or until chops are done (160 degrees F). Meanwhile, combine tomatoes and dressing. 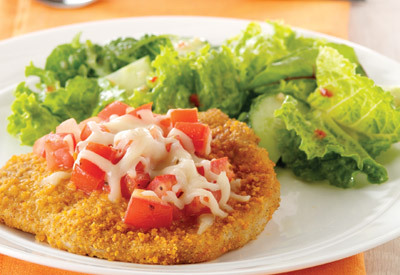 Top chops with tomato mixture and cheese. Bake 5 minutes or until cheese is melted.